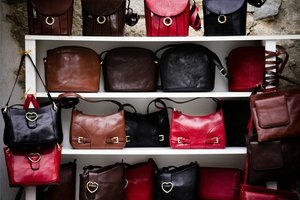 How to Spot Fake Dooney and Bourke Handbags. These days, everyone wants a Dooney and Bourke handbag, but few can afford them. These increasingly sought after designer accessories are quickly joining the ranks of Coach, Chanel and Gucci. Which is to say coveted by most, and copied by many. Telling a real from a fake requires a trained eye. Glance at the leather logo tag, visible on the front of the purse. If the stitching is not the same color as the thread that's used on the seams, it's a phony. Examine the handbag. British tan trim adorns all Dooney and Bourke handbags. If the one you're examining is any other color, you're not looking at the real thing. The purse handles also are always British tan leather. Study the metal details. Any hardware on a Dooney and Bourke will be brass, whether it's the protective feet, studs or the strap knobs. If you see silver, you know it's not a real Dooney. Peer inside the bag for more tip-offs of fraud. You'll know it's a fake if you don't see a leather duck logo with visible stitching and a red, white and blue registration number sewn beneath a leather seam. You might not be able to do this if you're just trying to size up whether your husband's ex-girlfriend is carrying a real Dooney and Burke or a knock-off. Shop at a Dooney and Burke boutique or a department store for an authentic bag. 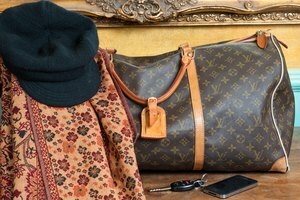 EBay can be a great resource for better-priced Dooney and Burke handbags, as long as you deal with sellers with primarily positive feedback whose ratings rank in the thousands. 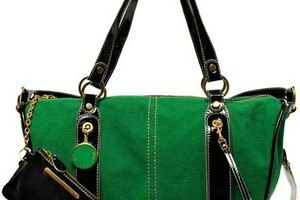 You can also find bargains on Overstock.com and BagBorrowOrSteal.com. 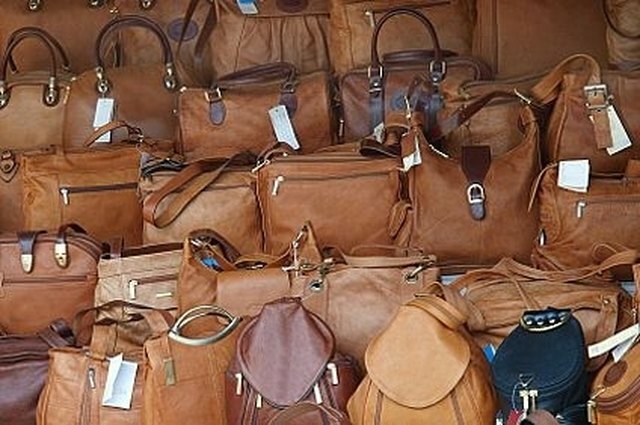 Avoid buying Dooney and Burke handbags from eBay sellers with little or poor feedback, especially if only vague photographs are supplied. While it might be tempting to purchase a Dooney and Burke knock-off, remember it's against the law, not to mention unethical.